Anngjerd Rustands works often evolve as she explores the physical properties of natural materials or basic industrial products, the symbolic value of her materials, and adds language. Her work nearly always revolves around human experience and understanding of nature. 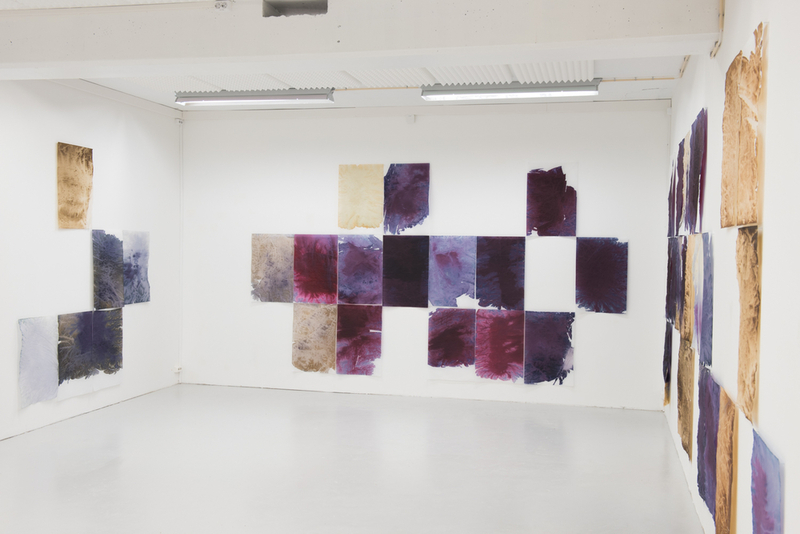 «Blåbær og aske» («Bilberry and Ash») is a composition of fragile paintings hung on the walls of Prosjektrom Normanns. The work is made repeating one simple process: Extract of bilberry (European blueberry) and wood ash dissolved in water are mixed together and poured on to a sheet of wrapping tissue paper. The pigment that gives bilberries their distinct colour is ph sensitive. 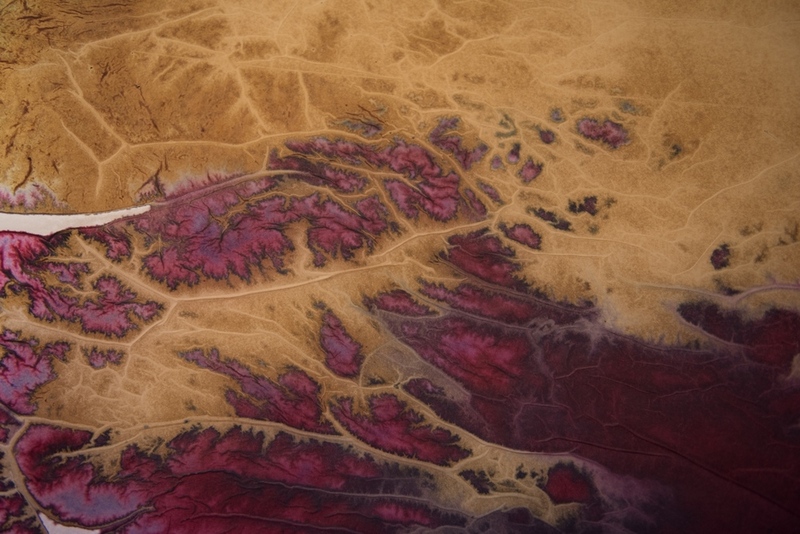 Increasing the proportion of ash, which is a base, changes the colour from a bright red to shades of purple, blue, and green, until it degrades into a pale brown. Anngjerd Rustand (b. 1982) in Arendal, Norway, is an artist based in Bergen. She holds and MA in fine art from Bergen Academy of Art and Design (2010). Previous shows include Entrée, Oslo Kunstforening, Møllebyen Lilleraturfestival/House of Foundation, Kristiansand Kunsthall, Hordaland Kunstsenter, and Kim? Contemporary Art Centre (Riga, Latvia). In 2013 she was nominated for Sparebankstiftelsen DnB artist grant. Her next upcoming show is «Unfolding Artists’ Books» at Den Frie Udstillingsbygning in Copenhagen, Denmark, in March. Rustand is also part of the Bergen based artist collective Ytter.